Bistek is the Filipino beef steak dish. It's usually a lean cut of beef, marinated in Calamansi (a tropical citrus fruit) juice and soy sauce, pan fried and the marinade added at the end. Bistec, spelled with a c rather than k, actually means Steak in Spanish. 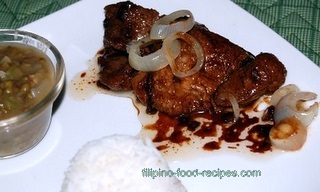 Nowadays, you can do this dish using Pork, Fish, particularly Bangus(Milkfish) or Pork Liver. 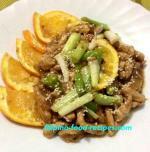 This Pinoy beef steak dish is made with onions cut into rings. The sauce is a little oily and tangy. I substitute lemon juice since calamansi juice is not readily available here. I also use olive oil which is healthier instead of the regular cooking oil because the oil is actually going to be a part of the sauce. The tangy taste depends on how long it has been marinating in the lemon/soy sauce mixture. 1 Mix the lemon juice and soy sauce. Steep the beef in the mixture and let it marinate for 30 minutes inside the refrigerator. 2 When the beef is ready, wring out the excess liquid and set aside. 3 Heat up the oil in the pan and fry the onions for 2 minutes, it should be half-cooked and not translucent. Remove the onions, and set aside, leaving the oil in the pan. 4 Pan-fry the beef in batches, cooking it for about 2-3 minutes per side. Once they are all done, add in the marinade, water and ground pepper. Let it simmer for 3 minutes. 5 To serve, place the onions on top of the beef like garnish. Perfect with a plate of hot white rice. For a more tangy Pinoy beef steak, marinate the beef for up to 4 hours. To easily cut the beef, place it in the freezer it for 2 hours until it is partly frozen. You will be surprised to find how much easier it is to cut. For a more tender Bistek, try to slice the beef on a bias, or diagonally across the grain. If the beef is a little tough, pound it with a mallet or with the back of the knife to make it tender. You must do this before you put the beef in the marinade.